The site of a water main rupture last month in Echo Park, a Los Angeles neighborhood. LOS ANGELES — The scene was apocalyptic: a torrent of water from a ruptured pipe valve bursting through Sunset Boulevard, hurling chunks of asphalt 40 feet into the air as it closed down the celebrated thoroughfare and inundated the campus of the University of California, Los Angeles. By the time emergency crews patched the pipe, 20 million gallons of water had cascaded across the college grounds. 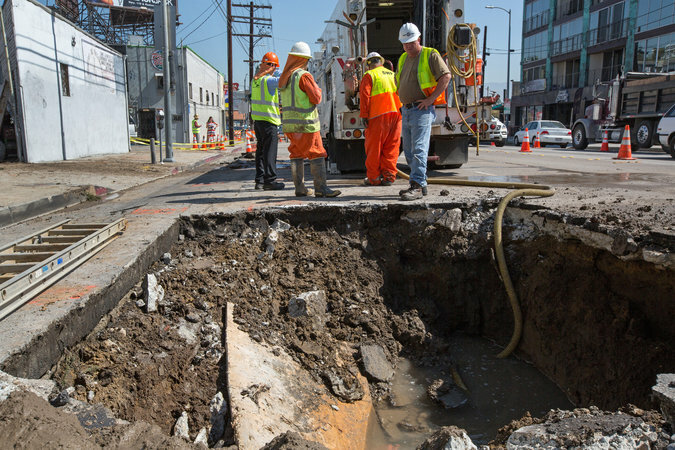 The failure of this 90-year-old water main, which happened in July in the midst of a historic drought, no less, was hardly an isolated episode for Los Angeles. Instead, it was the latest sign of what officials here described as a continuing breakdown of the public works skeleton of the second-largest city in the nation: its roads, sidewalks and water system. With each day, it seems, another accident illustrates the cost of deferred maintenance on public works, while offering a frustrating reminder to this cash-strained municipality of the daunting task it faces in dealing with the estimated $8.1 billion it would take to do the necessary repairs. The city’s total annual budget is about $26 billion. Severely broken sidewalks are common in Los Angeles. Los Angeles’s problems reflect the challenges many American cities face after years of recession-era belt-tightening prompted them to delay basic maintenance. But the sheer size of Los Angeles, its reliance on the automobile and, perhaps most important, the stringent voter-imposed restrictions on the government’s ability to raise taxes have turned the region into a symbol of the nation’s infrastructure woes. There are constant reminders of the day-to-day burdens that the dilapidating infrastructure poses here. The city is battling a class-action lawsuit from advocates for disabled people because of broken sidewalks that are almost impossible to navigate in a wheelchair, and challenging for all pedestrians trying simply to make it home. The average car owner here spends $832 a year for repairs related to the bad roads, the highest in the nation, according to a study by TRIP, a nonprofit transportation research group based in Washington. Families here routinely spring for expensive strollers to handle treacherous sidewalks. City officials estimate that it would cost at least $3.6 billion to fix the worst roads, $1.5 billion to repair the sidewalks and $3 billion to replace aging water pipes. The problem is exacerbated by cutbacks in federal spending on public works. “The sense is that more and more, we are going to be doing things alone,” said the mayor, Eric Garcetti. Close to 40 percent of the region’s 6,500 miles of roads and highways are graded D or F, meaning they are in such bad shape that for now city officials are concentrating maintenance efforts on roads that are in better shape, and thus less costly to fix. 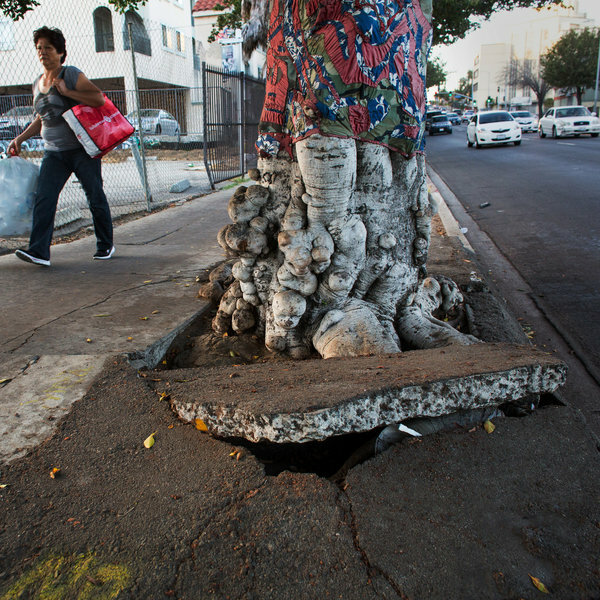 More than 4,000 of the 10,750 miles of sidewalks are in severe disrepair, according to Los Angeles city officials. More than 10 percent of the 7,200 miles of water pipes were built 90 years ago. The average age of a city pipe is 58, compared with an optimal life span of 100 years. While that may not sound so bad, at the current level of funding it would take the Department of Water and Power 315 years to replace them. Marcie L. Edwards, the general manager of the department, said that the pipes were not in as dire shape as those in some other cities, and that the department had spent more on replacing pipes. Even with more money, she said, there are limits on how fast her department can move. A rupture in July on Sunset Boulevard. City officials estimate that it would cost at least $3 billion to replace Los Angeles’s aging water pipes. Still, the water main break was unsettling because, unlike the war-zone-like patches of streets and sidewalks that have been cast asunder by tree roots in some neighborhoods here, this was a hidden problem until it was revealed in a geyser to motorists waiting at a traffic light. As such, it has become a symbol of the larger problem. And here, as in other cities, the demand for public works comes as the costs of municipal pension plans are shooting up — a confluence that has alarmed business leaders. “Once those payments are made, there’s not much money left, if any, to invest in infrastructure,” said Gary L. Toebben, president of the Los Angeles Area Chamber of Commerce. The challenge also coincides with a push by city leaders to move Los Angeles away from its historic reliance on cars, with heavy investment in its expanding mass-transit system and bicycle lanes. In an interview, Mayor Garcetti said that any public works campaign would have to factor in that change. California is also known for being averse to taxes. Earlier this year, city officials debated asking voters to approve a plan to add half a cent to the 9-cent city sales tax. That would raise enough for the $3.6 billion in road reconstruction but just $640 million of the $1.5 billion needed for sidewalk repairs. City Council leaders and Mr. Garcetti decided against putting anything before voters, probably until November 2016, to give the city more time to come up with a plan that has a chance of winning. Kevin James, a conservative talk-show host who ran for mayor last year and was appointed by Mr. Garcetti to lead the Board of Public Works, said a sales-tax increase was needed to deal with a serious threat to the city’s well-being. Funds to replace water pipes would come, presumably, if the Department of Water and Power gained approval from the City Council to increase water rates. Because of the drought, the typical city resident’s monthly bill for water has risen to $60, from $34.85 in the fall of 2011, reflecting the higher cost the department had to pay to purchase water. “The longer we wait, the more expensive it’s all going to be.” said Mr. Nahai, the former head of the Department of Water and Power.